cool, but why not just control it all from your computer. Set an array of them up would make for a cool effect. I hadn’t heard of a Rubens tube before. It would make a pretty cool demo for kids teaching them about standing waves. I was thinking, thats the wierdest looking rubik’s cube i’ve seen yet. @Pete: funny, i first heard of this via this educational video. @Xeracy That’s also the first place I saw one. For all of the ICE and Science Guy shows I saw as a kid with liquid nitrogen and tesla coils, I’m surprised I never saw this. It seems like you could do so much cooler things with a wiimote and a tube of fire than sweeping the pan and volume of music. I’d also be curious to see what it looks like if you put the gas into the tube via a center tap and run each of the stereo channels to opposite ends of the same tube. I may just have to build myself one of these. Wow! I did not expect that to sound musical at all. Most ‘experimental midi controller’ type things end up sounding awful (or at least non-melodious), but that was quite a spectacle of sight and sound. @charlie I’m curious if it would work as a Reuben’s Tube? I think the cylindrical shape of the pipe has a lot to do with the SWR effect. A box might do SOMETHING but probably not as coherent as this. doh, I meant Reuben’s Cube. Those flames aren’t nearly big enough! More power!! Great, now everybody will want a flame display frequency panel. LEDs are SO last year. That is pretty epic. Now what he needs to do is realize that his Ruben tubes give off IR light (hey, they’re FIRE!) and use those as input for the Wiimote camera.. 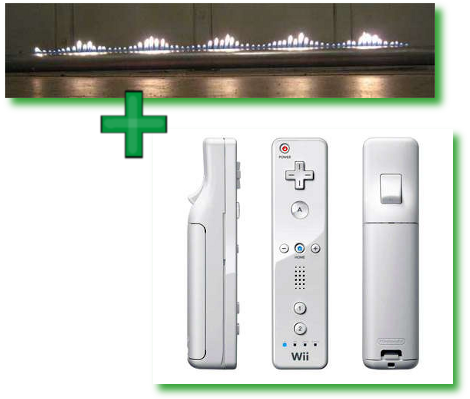 I always think it’s funny when people incorporate wiimotes into their projects for no reason.